In the southwestern reaches of Virginia, landowner and teacher Gail Marney resides on an inter-generational family farm. Her great-great grandfather moved here in the early 1800s and served in the Civil War. Her great uncle, Elihu J. Sutherland, who served as a judge and whose books are primary sources for many current scholars, also called this place home. Gail’s son now lives on a section of the farm and he, too, has a son living there. Gail figures her grandson is the seventh generation of her family to occupy their 300 acres. This place in Dickenson County, however, is the site of a huge extractive industry keen on drilling the natural gas beneath Gail’s and her neighbors’ land. “Since moving here, it’s been a constant battle with the gas well companies,” she says. According to Gail, subcontractors for Equitable Gas frequently trespass on private land while surveying well sites. Property is often rendered inaccessible by pipelines placed above ground, and water trucks and massive equipment needed for the gas drilling process tear up local roads not designed to support them. The problem, says Gail, is that while she and her family may be the landowners, the gas companies own the mineral rights, something her great-grandfather and many others in Dickenson County sold to buyers around the turn of the 20th century. Neither the buyer nor seller really knew what the contract meant long-term, she says, and most were happy, for instance, to let companies haul rocks off their land. Nearly 100 years later, Dickenson County’s water quality is in danger. The Marney family spring used for at least a century has vanished, and Gail believes it was sunk by the gas well drilling. She and her family now haul water from a source farther away while they wait on grants to receive city water. The community is signing petitions to bring clean water up to higher elevations. “Having clean water for clothes, dishes, and showers will bring relief to a lot of people,” Gail says. Not having to rely on bottled drinking water will be another convenience. Through all of this, Gail remains attached to Appalachia and her home. 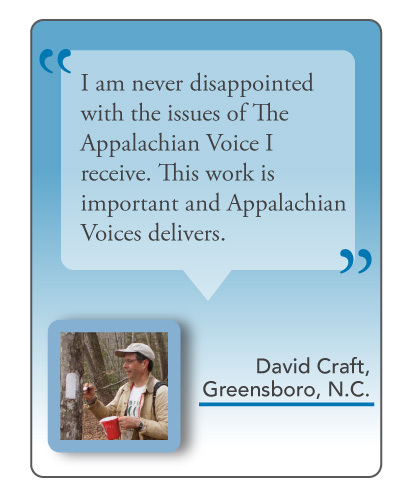 One of the ways she found to stay involved with protecting the region was becoming a distributor of The Appalachian Voice in Dickenson County, something she has done for almost nine years. She is also involved in the Appalachian Studies Conference at Virginia Tech, the place she finished her master’s thesis on the daughters of Mother Jones in 2007. Gail feels that her county’s situation is a gateway to furthering environmental education. When she previously taught government at Haysi High School in Dickenson County, she would try to incorporate environmental issues into her lessons — everything from soil erosion due to gas drilling to the effect of everyday littering. She would even drive students out to look at some of the coal strip mining going on. Seeing firsthand the effects on people living by strip mines is eye-opening, she says, even for those who live only a few miles away. 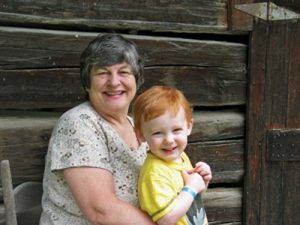 Today, Gail teaches advanced placement courses online and continues to live with her family on the farm in Dickenson County.